Jesus sat down opposite the treasury, and watched people as they put money into it. How many of you have used a mite box? It’s a little blue cardboard box that’s a sort of Christian piggy bank. You put money into it every day in thanksgiving for the blessings in your life. As you call to mind the gifts you have received, your sense of gratitude is deepened. When your box is full, you give it to a church mission fund. In the Episcopal Church, this fund is called the United Thank Offering (UTO), an early form of crowdsourcing that turns many small contributions into sums large enough to do something special. The UTO was started by Episcopal women in 1889, and it continues to fund innovative mission and ministry work throughout the Anglican Communion. When I was growing up in the Diocese of Los Angeles, there was an annual ingathering of our mite boxes. Children from all over the diocese came together in an outdoor amphitheater to sing and pray and listen to a little preaching. And then came the big moment when all us kids got up and carried our mite boxes down a long aisle and up onto a stage, where a large hollow cross stood in the center. Then each of us in turn would place our little blue box inside that cross. It was something I looked forward to every year. It was exciting to come together with so many other children, to see myself as part of a larger community––the community of Jesus’ youngest friends. Isn’t that one of the reasons we come to church––to see with our own eyes a living image of the communion of saints? I was a shy child, but the experience of carrying my mite box down the aisle to put it in the cross gave me a sense of agency, a sense that I could make a difference, that my contribution mattered. It was an exercise in self-offering, a tiny imitation of the self-offering performed eternally in the trinitarian heart of God––though I certainly didn’t grasp the depths of that theological mystery at the time! It just felt good to give. The part of the ingathering I loved best was watching all our little mite boxes, one by one, stack up inside that hollow cross. The stack grew higher and higher, turning the cross bluer and bluer, until it was completely filled in by the color of our collective gratitude. The term “mite box” isn’t used much anymore. They’re simply called blue boxes now, but the original term is from the King James Version of the gospel story about a widow who puts two “mites”––an old English term for the smallest of coins––into the Temple treasury. Those of us who have enough, those of us who do not want––we may feel the sting of this verse. We could all give more. Who does not hold something back when it comes to the collective responsibility of caring for one another, sharing God’s word, serving the needy, and repairing the world? It’s only practical. Times are uncertain, and budgets can be tight. Still, some of us might wonder how our contributions to mission and ministry stack up against our contributions to Starbucks, Comcast, Apple, and Costco. And so it is that countless preachers have asked: Are we going to be stingy like the scribes or generous like the widow? That’s a very good question, and well worth considering. But many biblical scholars tell us that it is not the question Jesus is asking in this particular story. There are certainly many places in the gospel when Jesus challenges our priorities, as when he tests the commitment of the rich young man, or warns his friends about the cost of discipleship, demonstrating just how serious he is by giving himself up to death, even death on a cross. The way of Jesus isn’t easy, and when he asks whether we can drink the cup that he must drink, we do tend to stammer. But this particular moment at the Temple treasury is not a stewardship story. It’s a justice story. You see, the Temple was not just a place of worship in the benign sense we might assume from our own church experience. It was a marketplace, an exploitative economic system which fostered and exacerbated the extreme economic inequality of first-century Palestine. The money collected into its treasury did not go to things like pastoral care or outreach. It funded a bureaucracy of sacrifice which benefitted the few while sucking up the meager portions of the many. As Ched Myers says in his study of Mark’s gospel, “The Temple, like the scribal class, no longer protects the poor, but crushes them.”[ii] Or as Jesus puts it so succinctly, the rich “devour widow’s houses” (Mark 12:40). Now in Mark’s account, Jesus is teaching in the Temple, saying a lot of critical things about the powers-that-be. The crowd is eating it up. Then Jesus takes a break, and goes to sit down by the treasury, the offering box where people drop off their contributions. And he says to his disciples, “Listen up. I want you just to watch for a while and see what happens.” And so they do. Mostly, it’s one well-dressed person after another strutting up to the treasury, pulling out a handful of money and, with a quick glance to make sure he’s being noticed, dropping it ostentatiously into the box. They didn’t have paper currency back then, so a big offering made a lot of noise as the coins clattered into the box. It was a good way to get everyone’s attention. But as Jesus points out, all that theatrically lavish giving was not really sacrificial for the rich folks. For them, it was a bit of spare change. I like to think Jesus makes this comment in a stage whisper loud enough to trouble the pride of the prominent givers. And then this widow steps up, very quietly, to drop in her two mites: an insignificant act by an insignificant person, the kind of thing no one usually notices. Such a small, humble gesture by the sort of person who has been virtually invisible in every society––poor, powerless, unimportant, not male. Look, Jesus says. Look at that woman. See her situation, see who she is. Don’t just see what she is doing; see what is being done to her. She is being exploited by the injustice of an economy which takes everything from her and gives nothing back. But do you notice how, instead of acting like a helpless victim, she is taking as much charge over the situation as she can? Though the system is corrupt, she will not be deterred from the devotional practice of making a sacrificial offering to God. 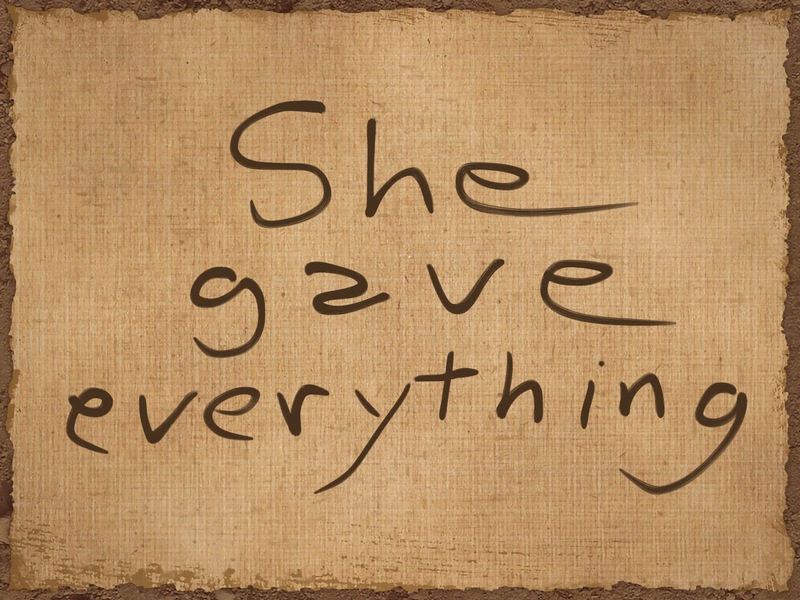 She has the heart of a giver, and she will not let that be taken from her. Nor will she live in fear. Even though she has little and is living on the edge of survival, she refuses to act out of a grasping sense of scarcity. She trusts that the Lord will provide. And perhaps she is even having some fun at the expense of the preening scribes, making an ironic contrast between their stinginess and the breathtaking costliness of her two little mites. The text doesn’t say any of this, but when Jesus tells me to look at the widow, that’s what I see. So it’s not a stewardship story in the usual sense. Jesus doesn’t end with “Go and do likewise” the way he does when he’s urging exemplary behavior. No, this is a justice story. And I think what Jesus is telling us here is this: Look! Look closely at what’s happening around you. Start to notice what is too often invisible: the injustice of the way things are, the people who are left out or left behind, the people who are invisible. Look at the way we ourselves participate in that injustice, consciously or unconsciously. Look at the assumptions and blindnesses which allow us to enable or perpetuate the brokenness and harshness of the world with insufficiently troubled consciences. Let the widow in the Temple be our teacher, inviting us to wonder about who she is and what she does, and about who we are and what we do. Yes, do have the heart of a giver. Fill up the hollow cross with your blue boxes. Yes, refuse the fearful mentality of scarcity, and trust that the gifts you need will continue to show up in your life. And yes, open your eyes to everything that diminishes human flourishing, and discern the actions you can take––and the actions we can take together––to restore justice, repair the world, and welcome the Kingdom of God. In that small moment, Jesus invites us to see the wrong in our world. But he also encourages us to see the possibility for a life of gratitude and giving, manifesting itself in even the smallest of gestures. This gospel reading happens to coincide in the Lectionary with the 100th anniversary of the end of the Great War, known to us now as the First World War. November 11, Veterans Day, used to be called Armistice Day, to commemorate the moment when the guns ceased their terrible thunder on the 11th hour of the 11th day of the 11th month in 1918, the moment when a 4-year nightmare came to an end and peace was declared at last. When it was over, the old world was finished, and one could argue that we’ve never quite recovered. Certainly the ideology of history as steady progress has been thoroughly discredited. We worry––a lot––about the future, and about our power to shape it wisely. But let me end by dropping a few mites into our common treasury, in the form of words from someone who lived through the Great War with her hope intact. Vera Brittain was a brilliant young woman studying at Oxford when the war broke out. She left school to volunteer as a nurse, working near the front lines in France to treat the seriously wounded. The man she was in love with, as well the brother she adored, were both slaughtered in muddy battles. As a woman, and as a young person, Brittain was hardly a major player on the stage of history. She had only a few small mites to give for the repair of a world so wounded and shattered. It did not seem, perhaps, as though we, the War generation, would be able to do all that we once hoped for the actual rebuilding of civilization. I understood now that the results of the War would last longer than ourselves; it was obvious . . . that its consequences were deeply rooted, and farther reaching, than any of us, with our lack of experience, had believed just after it was over. . .
What Brittain called “our present halting endeavors” to repair the world was too soon interrupted and mocked by Auschwitz and Hiroshima, and now, in our own day, is under assault again by the shocking resurgence of authoritarianism and tribal hatred in so many countries, including our own. In the face of such immensely discouraging challenges, we feel the poverty of our own capacities. Can our two mites make any difference at all? Jesus thinks so. When he asks us to look at that widow, he wants us to see her two mites not as an indicator of poverty, but as a sign of strength. Weakness shall the strong confound, as an old carol reminds us. That woman wasn’t daunted by how corrupt the system was, or how uncertain tomorrow felt, or how insignificant her actions seemed. No matter what, she was going to continue being who she was: generous, grateful, and trusting. “Look,” he says. “Look: I am making all things new. This homily will be preached on November 11 at Grace Episcopal Church, Lopez Island, WA. [i]Mark 12:43-44, trans. Eugene H. Peterson, The Message: The Bible in Contemporary Language(Colorado Springs: NavPress, 2002), 1836. [ii]Ched Myers, Binding the Strong Man: A Political Reading of Mark’s Story of Jesus(Maryknoll, NY: Orbis Books, 1989). [iii]Rupert Brooke, “Peace,” in Max Egremont, Some Desperate Glory: The First World War the Poets Knew(New York: Farrar, Strauss and Giroux, 2014), 57. [iv]Paul Fussell, The Great War and Modern Memory (Oxford: Oxford University Press, 1975), 21-22. [v]Philip Larkin, “MCMXIV,” in Fussell, 19; Robert Graves, “Recalling War,” in Egremont, 294; German prisoner interviewed by Philip Gibbs after the battle of the Somme, in Fussell, 72. [vi]Vera Brittain, Testament of Youth(London and New York: Penguin Books, 1933/2004), 645, 655-56.